Foot steppers are easy and convenient to use both at home and at the office. Getting out the door and to the gym can be challenging, especially on Saturdays when all you want to do is sleep in. It would be easier to have a home gym, but not everyone has the room or the extra money to make this happen. A foot stepper is a great alternative. It’s a small exercise machine that is reasonably priced and works your legs and glutes in an up-and-down or side-to-side motion. Working with a foot stepper is an effective way to get an aerobic workout. There are several different foot steppers on the market. You have foot steppers that work the legs and glutes in an up-and-down motion and other foot steppers that have more of a side-to-side motion, similar to skiing. The benefits with the side-to-side motion with these foot steppers are that the movement helps work your legs muscle as well as your abdominal and hip muscles. Get an all over workout with the side-to-side motion foot steppers. Several foot steppers also come with resistant levels that the user is able to adjust. Different resistance levels can help you adjust your workout accordingly. You may be wondering how going up-and-down or side-to-side on a foot stepper will keep you interested enough to get through a 30-minute workout. To spice up your foot stepper workout and burn more calories, use interval training. With interval training, you increase the intensity of your workout in order to work harder and burn more calories. With the foot stepper, start with a five- to 10-minute warm up at a moderate intensity. Increase your intensity so that your breathing becomes heavier and speaking during your workout is challenging. Continue this intensity for three minutes. Slow down to a moderate intensity for three minutes. This is one interval. Repeat for six to eight intervals. To get an all-over workout, work your upper body as your exercise on your foot stepper. Many foot steppers come with handles and some include resistance bands instead of handles. If your foot stepper has neither, you can include free weights during your workout to pump your upper arms while stepping. Including several upper arm movements and exercises while on your foot stepper will not only give you a fantastic aerobic workout, but a strength-training workout as well. Foot steppers are not only convenient and storage-friendly for your home, but they can be used at the office as well. Using a foot stepper under your desk at your office can be an effective way of getting your aerobic and strengthening workouts even on your busiest days. 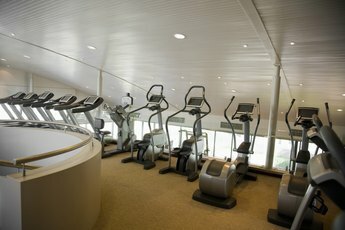 According to an article on KCBY.com, you can burn 100 calories per hour on average when you use your foot stepper under your desk. Working out with a foot stepper at work can help improve your posture, blood circulation and keep your energy levels up. 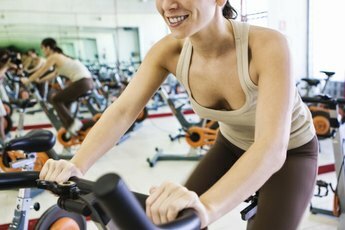 What Muscles Are Used When Using a Pedal Exerciser? 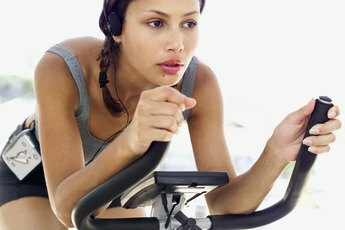 Can a Pedal Exerciser Give a Good Workout?